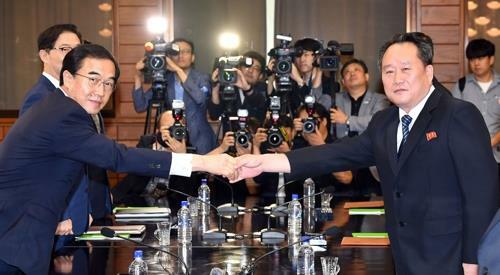 PANMUNJOM/SEOUL, Aug. 13 (Joint Press Corps-Yonhap) -- South and North Korea began high-level talks early Monday to discuss holding a summit meeting between their leaders aimed at deepening inter-Korean relations. The meeting started at around 10 a.m. on the northern side of Panmunjom in the DMZ, which separates the two Koreas. South Korea's delegation is led by Unification Minister Cho Myoung-gyon. His North Korean counterpart is Ri Son-gwon, chairman of the Committee for the Peaceful Reunification of the Country. "The issue of improving and developing the relations between the two Koreas is the shared and consistent opinion and direction for all people living in the North and the South," Ri, the North's chief delegate, said at the start of the talks. "Let's start this meeting to produce good results." "With preparations underway for yet another summit in Pyongyang between the leaders of the North and the South, I believe that when we discuss this matter, we can come up with answers going forward to things that our people want and wish for," he added. Cho struck a similarly optimistic tone, saying that any differences would be tackled when the two Koreas keep "the same mind." The talks will focus on ironing out details, such as the date and venue, for what will be the third summit meeting between South Korean President Moon Jae-in and North Korean leader Kim Jong-un. The two agreed to hold their summit in Pyongyang in the fall following the first meeting in April and second in May. Observers expect that the third Moon-Kim summit will likely to be held either in late August or early September. The high-level talks come amid growing concerns that the denuclearization process seem to be in a stalemate since the June 12 summit between North Korea and the United States. Washington and Pyongyang appear to be accusing each other of dragging their feet in implementing what their leaders agreed on at the historic summit. The U.S. has urged the North to intensify its denuclearization efforts, while the North has argued that the process should be carried out in a simultaneous and phased manner. Also at issue might be the declaration of an end to the 1950-53 Korean War by the end of this year, a promise made during the April summit between the two Koreas. The North has called for South Korea and the U.S. to make good on the promise, while Washington, in particular, has demanded the North take serious denuclearization steps first. Also included in South Korea's four-member delegation are Vice Unification Minister Chun Hae-sung and Nam Gwan-pyo, a senior director from the presidential National Security Office. The North's five-member delegation includes Pak Yong-il, vice chairman of the reunification committee, Vice Railroad Minister Kim Yun-hyok and Pak Ho-yong, vice minister for land and environmental protection.